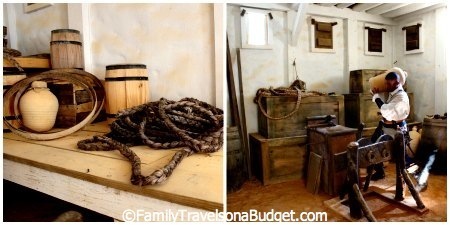 I was provided free admission to Mission San Luis for purposes of this article. All opinions are my own. To learn more, read my disclosure policy. Mission San Luis is housed in and behind a grand building — much fancier than I expected. 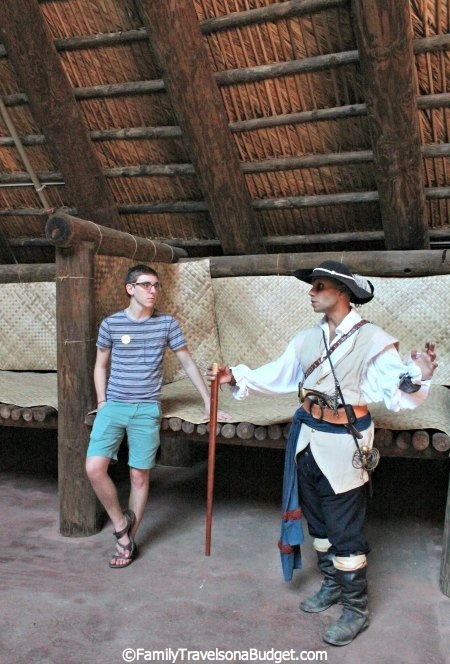 We entered the lobby to be greeted by a costumed volunteer who directed us to the large theater for a historical film explaining the history of the Apalachee, natives of the region for hundreds of years before European settlers came. The movie went on to explain that the Appalachee, recognizing the value of good relations with the Spanish, invited Catholic friars to settle there. 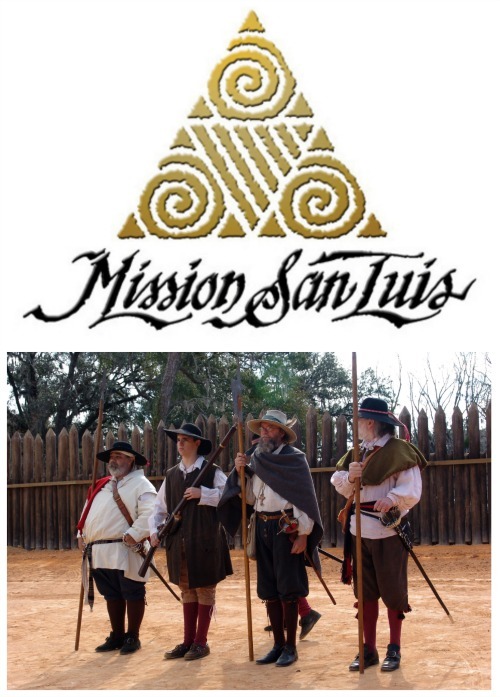 Mission San Luis was one of the earliest missions founded in Florida, where friars converted Apalachee to Christianity and Apalachee provide food for the Europeans. 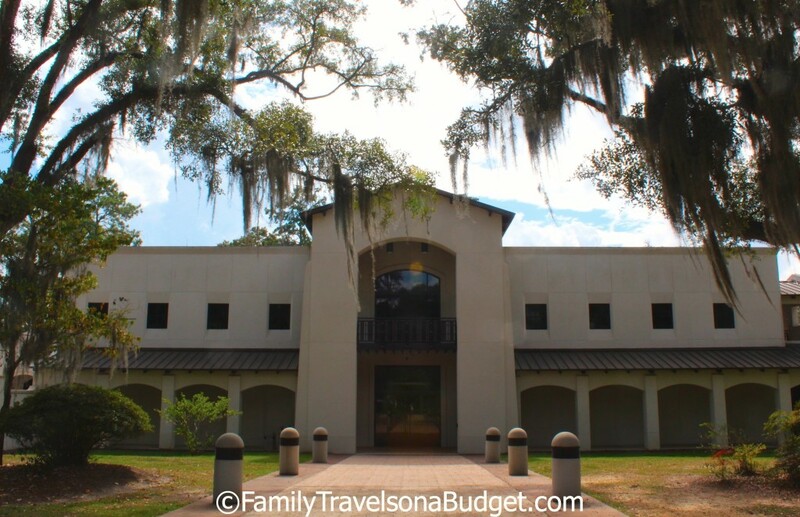 At Mission San Luis, the Spanish friars and Apalachee co-existed peacefully. They shared space, but maintained much of their traditions as well. Sadly, as with much of Native American history, Mission San Luis was abandoned and destroyed by the Spanish colonists to avoid a British takeover. The Apalachee scattered to what is now Pensacola and the Spanish retreated to St. Augustine. A fascinating century of history was lost. An archeological dig at the site of the mission, which is where the museum now sits, provides historians with incredible insight into how the two communities melded so well. It gives us a chance to look back and, perhaps, learn from our history. We visited on a Sunday, when the Mission is usually not crowded. 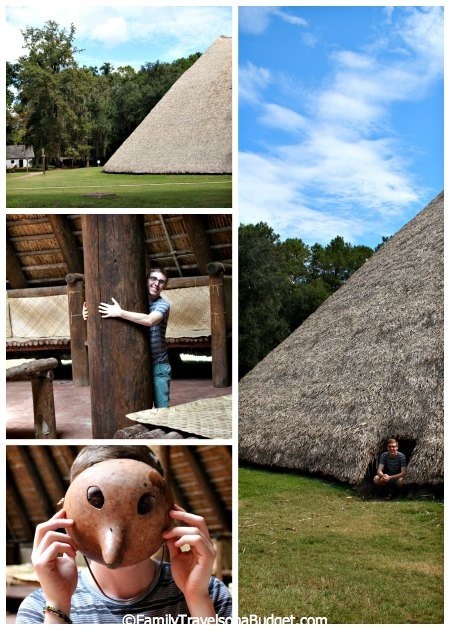 Weekdays and Saturdays, guests enjoy live volunteer re-enactments depicting Apalachee and Spanish settler life. The museum also offers a variety of workshops ranging from archery lessons, charcoal making, gardening tours, black powder musket rifle demonstrations and much more. While we didn’t get to see most of that, the costumed volunteers who were there energetically shared their knowledge about the period and answered our many questions. Perhaps you’re wondering what my son thought of the mission? He loved it! Our itinerary provided us about 1.5 hours to tour the museum and grounds, and we ended up staying much longer. Thankfully, the second stop of the day didn’t mind! The Council House was essentially the equivalent of today’s city hall, town theater and lodge for the 1500 Apalachee residents in the region. The council house here sits on the same footings as the original, spanning more than 140 feet in diameter and stretching more than 5 stories high. The rafters, which hold up the thatched roof, are 72′ long and weigh more than 1000 pounds each. The chief would hold court here, making judicial decisions about neighborhood spats and other major decisions affecting the tribe. The entire tribe would congregate here for ceremonies that lasted long into the night. All around the outside edge, visitors could stay the night, with sleeping ledges provided. I’m not sure how much sleep they got while all the ceremonies were going on, but it had to be better than sleeping outdoors unprotected. • How could they possibly build it? Who knows — engineering genius! • Did it get hot with all the people crammed inside? Nope! The thatching provided insulation from the sun’s heat, and openings all around the base coupled with the center fire served as air conditioning, pulling cooler ground air in and up with the draft — again, engineering genius! • How did they get in and out? Through tiny doors! Really! They were forced to bow down as they entered the ceremonial house because the doors did not allow them to walk in upright — genius? Or pride? Our guide acting out his role as head of a Spanish home. As our tour continued, we explored reconstructions of the Spanish homes and learned the “politics” of the place. While the houses were small, furnishings and other items brought in from Spain set the wealthy apart from the poor. The richer Spanish women tended to rule the region. Our guide told us stories of cows trampling crops and other such foolishness that led to community spats — we haven’t learned much in 400 years. He explained how the community was laid out, what the Apalachee did for entertainment and work, as well as how the Spanish lived side by side. We saw the blacksmith’s shop and the Franciscan Church. The friar lived at the church. He was the spiritual leader, the town “doctor” and even the music teacher. He was responsible for teaching the natives Christian ways and his role was revered in the community. The reconstructed Franciscan Church sits on the same site as the original. More than 900 mission residents are buried beneath the church, so rebuilding it was a challenge. The rebuilt church does not have the same bright colors that were probably painted on the original walls, but it is quite similar to the original structure. 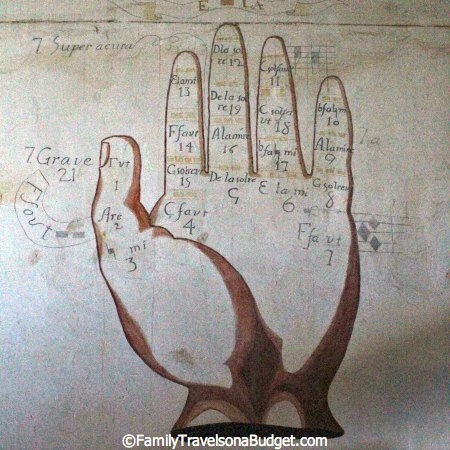 In one room, a Guidonian Hand was painted on the wall. 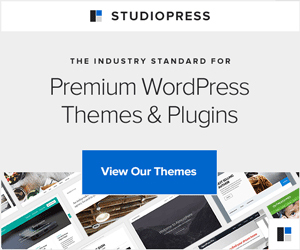 You don’t know what a Guidonian Hand is? Shocker! Anyway, the Franciscan priest used the Guidonian hand to teach his young students the music of the church. They could harmonize based on the hand points he used…. make sense? Of course, what good is a Spanish outpost without a fort? Mission San Luis does not disappoint here either. On display, guests will see a number of weapons, maps (take a good look! There’s a reason they have sea monsters on them), the long table where soldiers ate, and tall pots centered between sections of wall. Most everything is self-explanatory, but the pots — they seemed so strange. We discovered that the soldiers would build fires in the pots on cold nights to heat the walls. 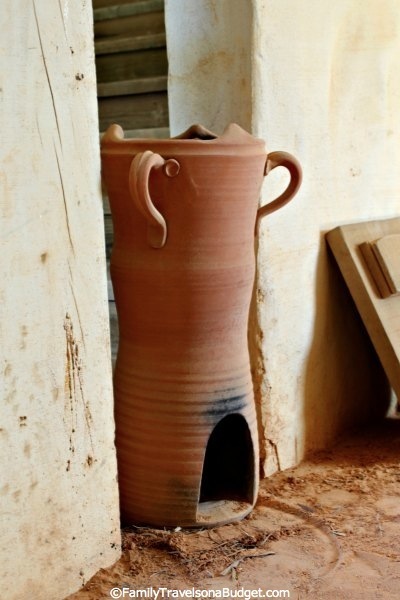 The walls were made of conductive clay and heat would radiate from the fire pots throughout the building. They didn’t get cold! This attraction gets high ratings on TripAdvisor for good reason. 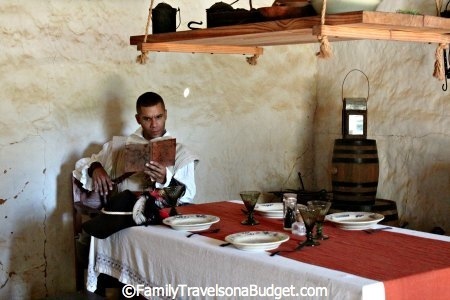 When visiting, come with an expectancy to learn something new about history. Take time to watch the film — it’s well done and explains what you’ll see outdoors. Also be sure to explore the museum — which houses a large number of artifacts found at the site and explains how the history of this Mission was rediscovered. It’s quite fascinating — and challenges our perception of history. The museum is open Tuesday-Sunday, 10:00 a.m. to 4:00 p.m. Closed major holidays. The park has picnic tables on site and pets are welcome on leashes. Walkways are easy for strollers and wheelchairs. You might see a wedding or two if you go on a Saturday! We enjoyed our visit and learned a lot! Thanks again, to the people of Mission San Luis and VisitTallahassee for sponsoring our visit. Go to VisitTallahassee.com to plan your Tallahassee getaway: events, lodging, dining and more!